Downpatrick police are reassuring their communities that they are continuing to works hard to tackle the issue of drugs following a number of sudden and unexplained deaths in the wider Belfast area that may be related to drugs. “Drugs remain a policing priority for us,” said Down Area Commander CI Deirdre Bones. “However it cannot be a policing issue alone and I would ask the public to assist us by reporting anything they know or suspect about the taking or dealing of drugs. Sean Paul Carnahan is in intensive care in Belfast after taking legal highs. 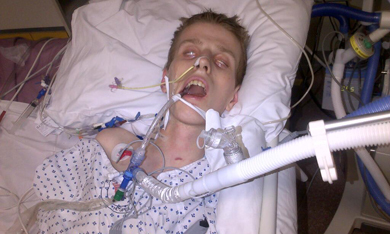 His mother asked for this image to be circulated to deter drug use and more tragedy. “The misery drugs can cause to communities, to families, to those who get involved in drugs cannot be measured. My officers continue to disrupt and arrest those involved in the sale and supply of drugs in an effort bring these individuals before the courts and work with communities and partner agencies to reduce the threat of harmful and illegal activity. “There is no such a thing as recreational drugs. All drugs that are not taken as prescribed by your own doctor can be dangerous and even life threatening. The taking of illegal drugs can be particularly more dangerous as it is often unclear what the drug is. PMMA (paramethoxymethamphetamine) is particularly toxic. Both dealers and users may be unaware that what they believe to be ecstasy actually contains PMMA. These pills are slower to take effect and often the user will take more. This can lead to seizures, convulsions, heart attack and ultimately death. The predominant symptom of fatalities around the globe has been hyperthermia (over-heating of the body). • People should be particularly careful if they are offered green coloured tablets with a logo of a crown or castle on them. • Do not take controlled drugs. • Do not take prescription medication that has not been prescribed for you. • Do not mix either with alcohol. The consequences of ignoring this advice are very dangerous and potentially life-threatening.